Hospital trusts across the country are being urged to use an initiative developed in the West of England to improve patient safety in emergency departments. The recommendation to all trusts in England to implement the ‘Emergency Department (ED) Safety Checklist’ comes in a letter issued this week by NHS Improvement. Designed to address the shared challenge of ensuring patient safety during periods of crowding, the ED Safety Checklist was originally developed and tested by University Hospitals Bristol NHS Foundation Trust with support from the Health Foundation and the West of England AHSN through its Patient Safety Collaborative. The checklist helps to standardise and improve the delivery of basic care in emergency departments, systemising the observations, tests and treatments that need to be completed in a certain order. It serves as an aide-memoire for busy staff, and any doctor, nurse, bank or agency staff can join the department and provide the right care by following the time-based framework of tasks. Following the success of the initiative at University Hospitals Bristol, the West of England Patient Safety Collaborative supported all seven emergency departments in the region to adopt the Checklist, developing a special toolkit to aid its adoption. Unless they are already using an equivalent evidence-based system, hospitals trusts are now being encouraged to use the both the ED Safety Checklist and the supporting toolkit. In 2017 the Health Service Journal named the ED Safety Checklist ‘best patient safety initiative in A&E’ and it won second prize in the Royal College of Emergency Medicine’s annual award. Use of the Checklist (or an equivalent) is now supported and endorsed by NHS Improvement, NHS England, the Royal College of Emergency Medicine, the Royal College of Nursing and the Care Quality Commission. NHS Improvement will hold a webinar at 9:30am on Monday 23 October 2017, led by Dr Emma Redfern, Consultant in Emergency Medicine at University Hospitals Bristol, who has personal experience of using the Checklist. Find out more and book your place here. Deborah Evans, Managing Director of the West of England AHSN, said: “It is fantastic news that our local ED Safety Checklist is now being recognised and picked up at a national level, particularly as it was created by clinicians for clinicians. South Western Ambulance Service NHS Foundation Trust. The NIHR Collaboration for Leadership in Applied Health Research and Care West (CLAHRC West) is currently evaluating the use of the checklist in the hospital trusts and ambulance service in the West of England and will produce advice and recommendations based on the research to facilitate the wider implementation of the checklist. 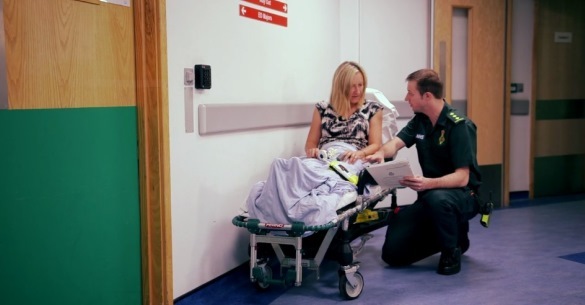 Channel 4 News had a feature on the ED Safety Checklist on 19 October. You can view it here.